This exclusive salon quality collection is ideal for all fur-types; The Essentials will infuse your one and only ‘s coat with the nourishing and hydrating properties of Argan Oil, rich in essential fatty acids, antioxidants and Vitamin E. Moroccan Pooch Essentials: Hydration Edition will surely leave that fur with increased manageability, loads of shine and softly fragranced. Moroccan Pooch Essentials are presented in an elegant gift box. Moroccan Pooch Hydrating Shampoo (7.4 fl. oz / 220 ml) is a salon quality gentle cleanser that infuses the coat with antioxidant rich argan and essential oils. Coat is left healthy looking with increased manageability and shine. Moroccan Pooch Hydrating Conditioner (7.4 fl. oz / 220 ml) A gentle conditioning and detangling formula for your #MPFurbaby frizzy or unruly coat. Moroccan Pooch Hydrating Conditioner restores your dog’s healthy coat and delicate pH balance with antioxidant rich argan and essential oils. Coat is left feeling smooth, healthy looking and manageable. 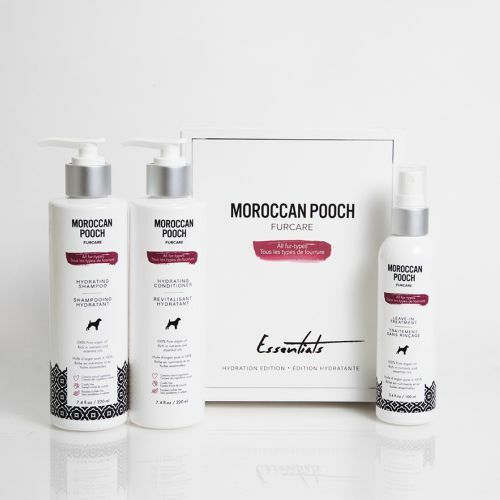 Moroccan Pooch Leave-In Treatment (3.4 fl / 100 ml) For any #MPFurbaby coat who needs immediate pampering. Spray Moroccan Pooch leave-in treatment which instantly infuses the coat with antioxidant-rich argan oil and essential nutrients. The treatment is absorbed quickly to revive moisture and shine revealing radiant looking coat between grooming sessions. Coat is left nourished, silky and softly fragranced.